The HRICP-MS laboratory under the supervision of Dr. Möller consists of a Thermo Scientific ELEMENT 2 high resolution sector-field ICP-MS coupled with an ANALYTE.G2 excimer laser with 193nm wavelength and 5ns pulse length. The instruments are housed in Nichols Hall, and equipped with a UPS system. The main laser applications are currently U-Pb geochronology of zircon, rutile and monazite, as well as trace element analyses in a range of minerals and glasses. Solution work can be carried out efficiently for trace element concentrations and Sr isotopes with an Elemental Scientific E2 autosampler system. The original ANALYTE.193 laser as well as the ICP-MS were acquired with University of Kansas start-up funds to Dr. Möller. 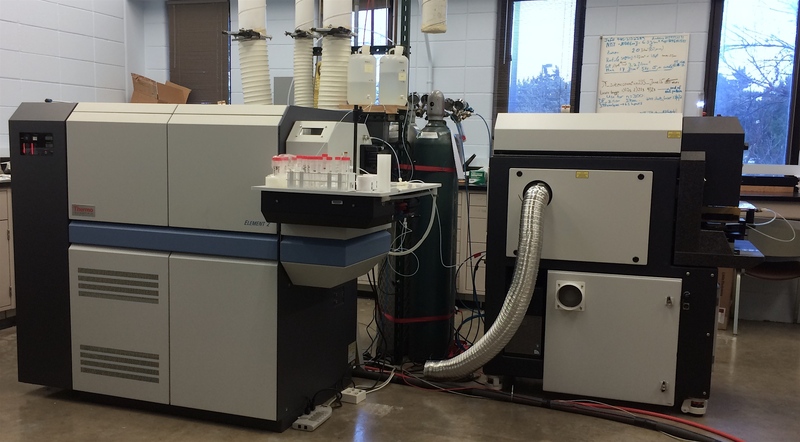 The upgrade to the ANALYTE.G2 laser in 2013 was made possible with funds from the college, the department and from scientific collaborator contributions. The Element2 with ESI autosampler on the left, the Photon-machines ANALYTE.G2 193nm ArF excimer laser with Helex2 cell on the right.